The 80's created so much great heavy metal no matter how big of a fan you are, there's always new underground bands and releases to discover. By pure accident, I happened across a copy of Bloodlust's "Guilty As Sin". I had never heard of them but popped the CD into the deck to discover yet another American speed/power metal band. 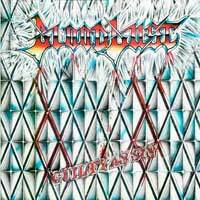 Bloodlust are a heavy metal band out of California, USA. Their style is similar to that of Savage Grace, Abattoir, Heretic, Heathen's Rage and Exciter. While they aren't quite a thrash band, they push beyond the traditional metal sound straddling the fence between thrash and traditional heavy metal. For the most part the songs are fast and heavy, but also melodic and memorable. "Ride To Death" is the album’s most immediately memorable song. Vocalist Guy Lord has a masculine power metal voice though he occasionally lets out some high pitched shrieks and screams. Unfortunately the recording and production of "Guilty As Sin" is a muddy mess. That wasn't all that uncommon in the 80's for low-budget recordings. At the times it wasn't really about pristine recordings, but rather about the songs and the attitude. (Take a listen to Megadeth's debut for a good example.) Despite this fact, the production isn't so bad that it's not enjoyable. "Guilty As Sin" was originally release in 1985 on Metal Blade Records. The CD re-issue also contains the band's self-released, 1988 recording titled "Terminal Velocity". The '88 songs feature vocalist Steve Gaines who also sang for Abattoir. His vocals are a bit more helium ingested at times than those of Lord. These tracks are slightly more aggressive and faster than the "Guilty As Sin" material, still firmly fitting into the speed metal category with some definite thrash influences. Overall, a solid slab of 80's speed metal and a welcome addition to my collection.